3 minute Chocolate cup cake..yummmyyy!! A 5 minute chocolate fudge cake that can be made even by kids! !Here’s how………. 1. 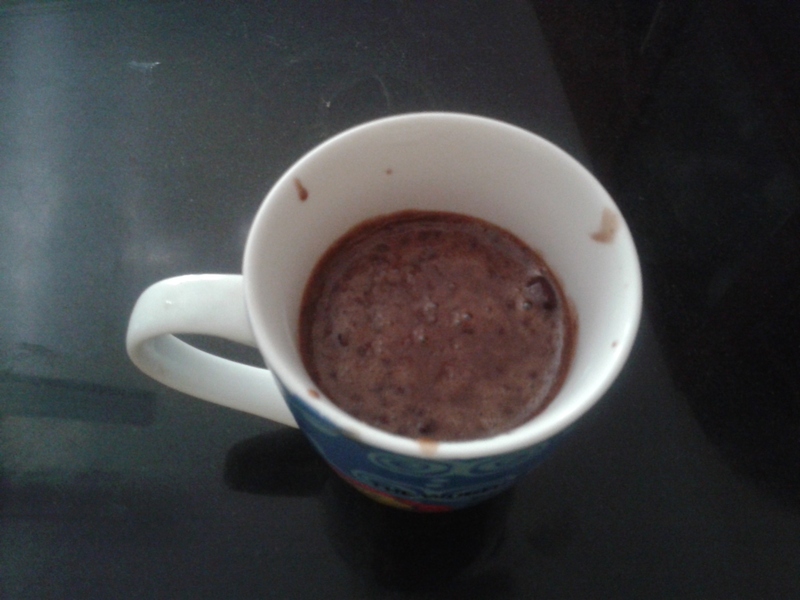 In the coffee mug, add the maida, sugar, cocoa powder,baking powder and mix well so that no lumps are formed. This is dry mixing. 2. Now add milk, oil, vanilla essence. Whip an egg well and add to the mix. 3. Mix everything nicely with a spoon so that no lumps get settled at the bottom of the mug. 4. Put the microwave on high heat and cook the mug with the mix for exactly 3 mins. Mind it exactly 3 mins. Try it with your microwave, if it gets too high then reduce the time to 2 mins and 50 secs. Do not worry it will not spill (as long as it is a big mug that you have used) and it will be cooked. 5. Let it stand for 30 sec in the microwave while it is switched off. 7. It tastes a little different than a regular cake but it is the quickest way to make cake with icecream or chocolate sauce.